I wanted to share one of the good things I put in my jar. It actually happened last week so I could have included it in my Goodie Jar – Check In #4, but I was so excited about the wrapping paper idea I got carried away with that. Anyway, last Thursday was Valentine’s Day and it was my second Nia class at the new time at one of the places I teach for the city of San Jose. I did not have one person in my class. Even though I don’t take it personally I still am usually a little sad when that happens, but this was a cause for a note in my goodie pitcher. You might be wondering why I would think no one showing up for my class is a good thing, well, as I said it was Valentine’s Day and I was happy because no one being with ME meant that they ALL have SOMEONE to be with! Whenever I think of that I cannot wipe the smile off my face! HOW GREAT IS IT THAT ALL OF THEM HAVE SOMEONE TO LOVE?????? I am not even talking about romantic love. I know some people like to be with their friends, their kids, their parents . . . . WHO is not the issue . . . . LOVE is the thing! They were all too busy with a loved one to be with me. I’m good with that. I am better than good with that. I LOVE that. So that is one of the things in my goodie jar! It is a GREAT thing that my students have someone to love! Oh! That is another good thing for MY jar . . . . I have someone to love . . . . how about you? 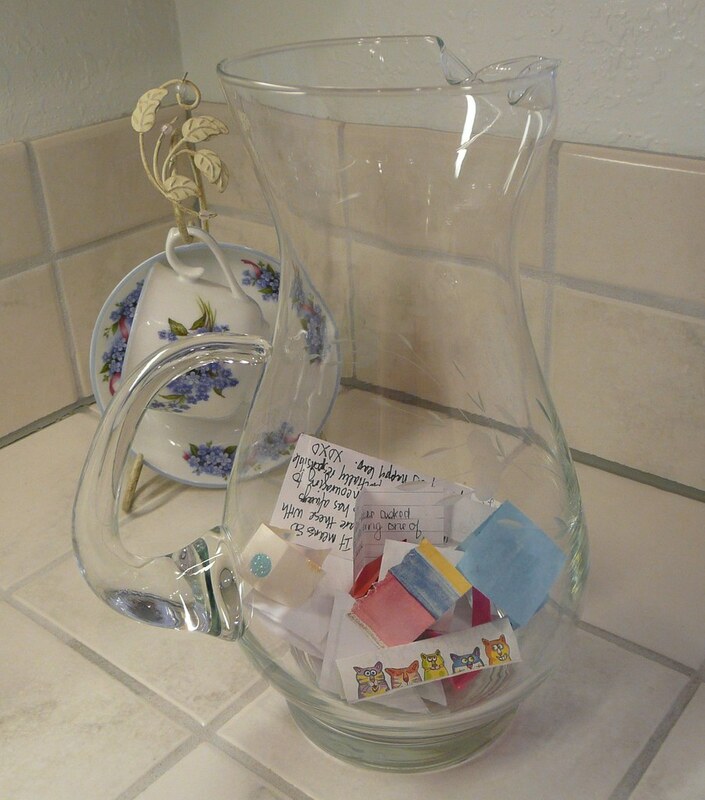 Are you adding things to your good things jar? I teach a Nia Class for the city of San Jose. The city has it set up pretty cool in that instructors can have a day and a time at a specific community center that we can call “my” class and we can also teach other people’s classes as a substitute. We have this forum where we post requests and needs. Many instructors have full time jobs and kids so they have other responsibilities that call them away from their regularly schedule class. Plus there is always a cold, a serious illness, or a bump/bruise or strain. This network of teachers allows us to live our lives and take care of ourselves when necessary. It also helps expose our community to different types of workouts and different teachers. I have shared before how at one point I was trying to make Nia be more like whatever it was I was subbing for. If you haven’t read that post, I am sure you might be able to imagine how that turned out. It made this Nia teacher very unhappy and I don’t think it was a great service for the attendees either. One of the reasons I applied for the job with the city was so that I could share Nia with the community. Recently I taught Nia as a substitute class for Zumba, and my thoughts on Zumba and agility were confirmed. A few of the student came up afterwards to talk to me about Nia. Some shared how they like it because it was gentle yet allowed them to work up a sweat and get a great workout. One woman made me giddy because she said the same thing that I had just decided about Zumba. It took me a while to get to this conclusion and she jumped to it her very first time. She said that Nia is more complete. She said that she loves Zumba, she does it three times a week, but the moves are not completed. She said it was nice to be able to finish a move. Nia allows you to move through the entire range of motion, through the entire range of the joint. I loved that she was able to get that from one class. I also love and appreciate that she can like both, Nia and Zumba. They are both cardio dance exercise workouts, but they are different. Seeming to always have to explain the two together, I am always thinking about it and just recently reached the agility conclusion. I explained in one of my posts how I feel Zumba seems to only move in one sensation. Well, having gone to a training and experienced the Zumba Fitness Program I believe a Zumba class can move in all five, but it concentrates on agility and touches on the rest. But they are in there if you know to look for them. So this student who was talking to me after class picked up on that fact that in Nia we move through all five sensations and Zumba focuses on one. This is not to say that is bad, this is just again pointing out how they are different. Also this is me sharing that it is not just other Nia teachers and my Nia students that think that, it is other people who are more familiar with Zumba than Nia. This is just a happy confirmation post sharing that I felt I got it right when I explained Nia and Zumba in that way. Yay. Both Nia and Zumba are great fun. I encourage you to do whatever it is that will get you up and moving! If you decide what type of movement you want it can help you decide what you can do to get it. Do you like to take different types of exercise classes? Do you like to just stick to one type of class? On my way home from teaching my Nia class in San Jose on a bright and beautiful Wednesday morning, I noticed a man at a utility box. I had seen him out of the corner of my eye so it did not register what he was doing until I was passed the box. So I looked at him in my review mirror. I pulled over to the side of the road to be able to really look to see if he was doing what I thought he was doing. Then I decided to back my car up, park, and get out to see. It just so happened that the day before I was on my way to the Roosevelt Community Center, and I took a wrong turn and found myself driving around not sure exactly how to get where I wanted to be and I noticed a set of utility boxes. Do you ever notice utility boxes? Probably not, huh? They are one of those things that are not that attractive so we learn to ignore them. Well, while I was driving around being lost, I noticed them. There was one that was painted with a bunch of flowers and then the one right next to it looked like a big red rose. I thought, “Wow! 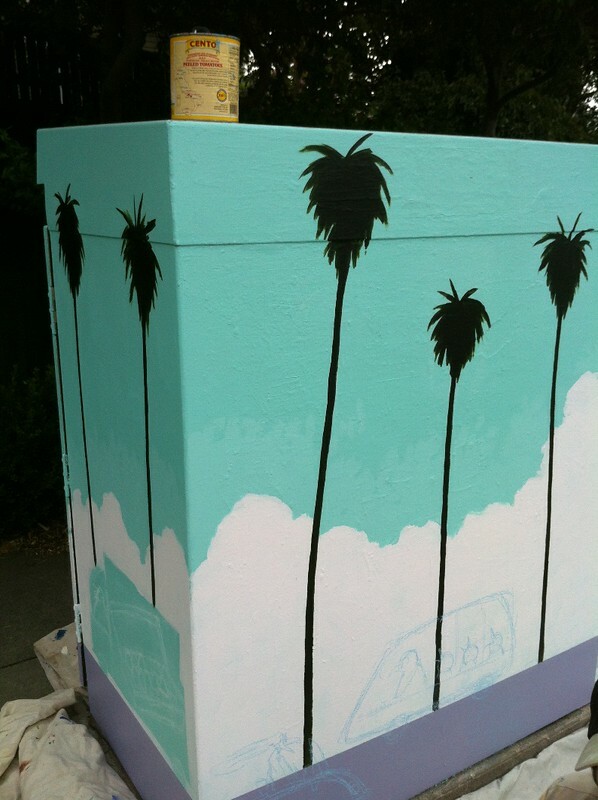 That is so cool.” So as I was driving home from Nia and I saw a man painting a utility box, I wanted to see what it was all about. We talked briefly, he said it was a project in the City of San Jose. They are lumping it in as an “anti-graffiti” project, but I like to just think of it as disguising something not attractive AND adding beauty at the same time. 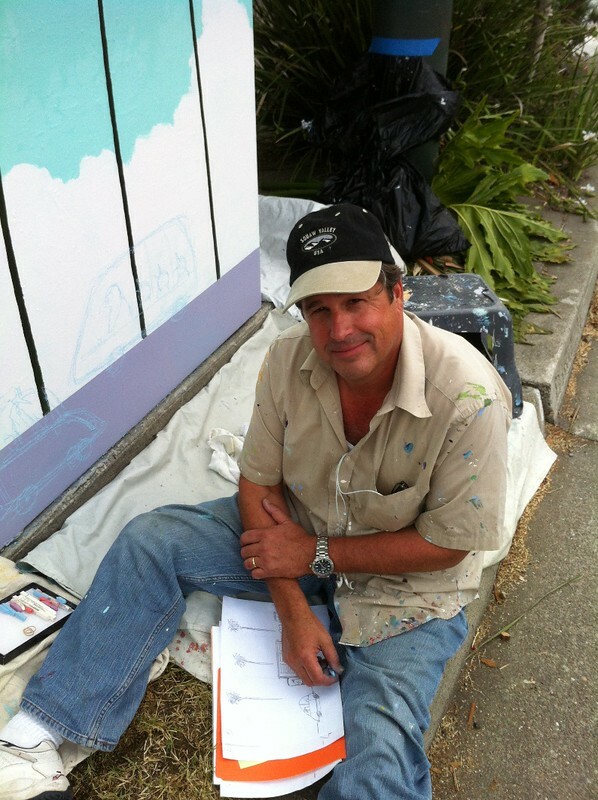 The artist, Scott Willis, was sitting on the grass by the box painting it. He handed me a fact sheet. I skimmed it and tried to hand it back and he said I could keep it. (YAY!) Because now I have the facts to share with you. The benefits are: bringing art into the neighborhoods, encouraging community engagement, offering temporary work for local artists, deterring and/or reducing the blight of graffiti. I know San Jose isn’t the first city to do this but I am excited to see these boxes around. 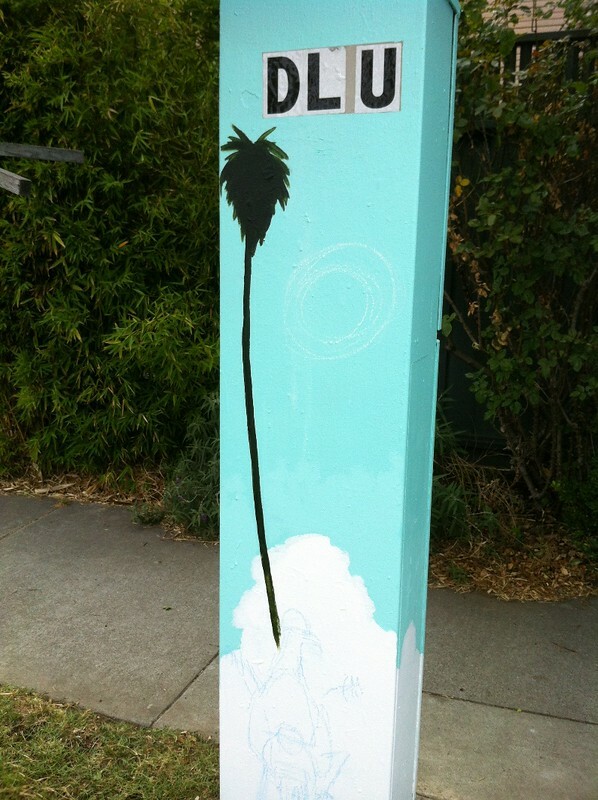 In fact the Fact Sheet states, “According to the Contra Costa Times, Hayward has found their art on utility boxes has reduced graffiti problems by 97%”. Wow. Ninety-seven percent. In addition to the sponsors paying the artists’ stipend they can pay an additional amount to have the box sprayed with an “anti-graffiti coating”. There are criteria for both the box locations and the art, but that is to be expected and the criteria even makes sense, such as the utility box can’t be on the replacement list. Nice that they don’t want an artist to spend time beautifying it just so it can be replaced. And the are must be tasteful, respectful, and not political, commercial, or religious. While the artist do get paid a small amount I am hoping that it will be advertising for them. I mean, if you see really compelling work on a utility box maybe it could lead to other things for the artist! The rose I saw the other day just keeps jumping into my head, it was so gorgeous. The art I saw on Wednesday was unfinished, I interrupted the artist. But since it is a box I pass at least twice a week on my way home from my Nia classes in Willow Glen, I will see the work in progress and post pictures upon its completion. For now you get to see the artist and his work in progress. I am relating this to health and wellness because beauty causes a good feeling. It is nice to see the plain utility boxes beautified. Here is the Facebook page for it (click here). So what do you think of this project? Do you have something like it in your city? Would you like to have something like it in your city? 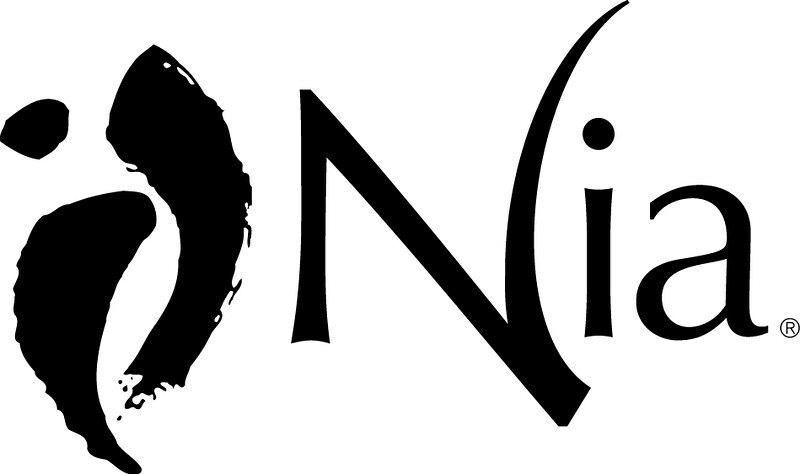 The Nia Class on Friday that I teach is at a studio that recently re-located from Los Gatos to San Jose. Being in a newish area I found myself dropping by a store I don’t normally frequent. I ended up buying some tea. 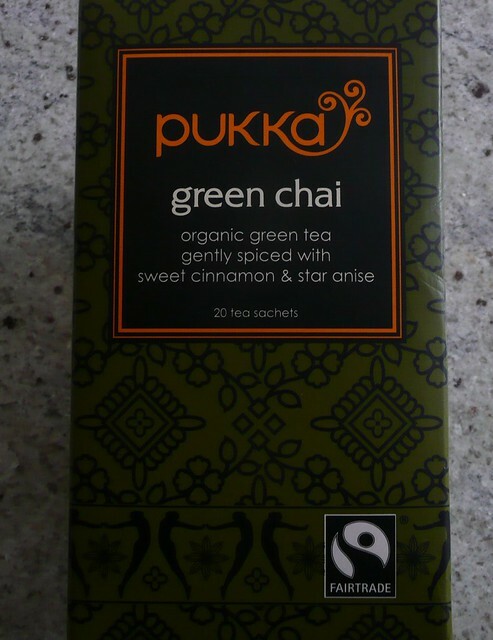 I know that green tea is supposed to be good for you and I found myself liking Chai, so I was happy to find some Green Tea Chai. Gently spiced with cinnamon and anise. The box also makes statements about ginger, cardamom, and licorice. I thought it just HAD to be good. I had just purchased some honey from a local bee keeper and I was so excited to try the honey with this tea. I came home and made a cup. I was very disappointed. It didn’t taste like anything, except the honey itself (which is fantastic, by the way!). It didn’t have a flavor that I could detect at all. I had been thinking that along with some of the benefits from green tea, I would be getting benefits from the cinnamon, ginger, and cardamom, and I would also get some flavor. With all of that in the tea I thought there would be something. Maybe I clearly didn’t see the “gently spiced”. But I was disappointed. I thought I would try spicing it up myself. So I added my own ginger, cinnamon, and I even added nutmeg. I figured that I would be able to reap the benefits of the spices if I put them directly in my tea. I ended up making a pretty tasty beverage. I would imagine that I could add my own spices to hot water and make any type of “tea” I want. I know it shouldn’t really be called tea as tea is make with actually leaves from a plant and not just spices. All I need to know is it tastes good and it helps keep me warm (it has been a bit cold around here lately). And, as I said, I can get the benefits from some of the spices. Granted the spices do tend to sink to the bottom of the mug in a wet pile, but if you keep it stirred you actually drink them. That would be the point—to drink them. One day, I grabbed the cayenne pepper instead of cinnamon — and you frequent readers must know — I DO NOT tolerate spice at all. I don’t like heat. I made a really spicy hot concoction. I saved it for my hubby, because it didn’t TASTE bad it was just to hot for me and I thought he would like it. He did. So I guess I can make him some spicy hot beverages too. As a reminder, ginger is an anti-inflammatory, so it is good for the body to help keep chronic inflammation at bay. It also has some nutrients and is used as a digestive aid. I usually use the powdered kind for my tea, but when I have the actual root I toss a little piece in my mug. Cinnamon is also an anti-inflammatory food. I have thought to add it to my coffee before and as stated in this post, my tea, but now I will just start making a spice hot water mix. Cinnamon is also consider a digestive aid. So why not just add some spices to some hot water and see what you come up with? Or add it to your coffee or tea? Honey and lemon are common things to put in hot water, I think I will try that with some of my spices. Get the whole shebang. Warmth, water, lemon, spices . . . sound like a winner to me. How about you? Spices to drink? Yesterday, after my Nia class in Central San Jose, I went to Campbell to pick up some locally “grown” honey. It has been pretty cold here so I have been drinking tea and I was thinking soup. It was at the last minute and through a chance of “well this light is green so I will turn this way” that I ended up at Trader Joe’s. I don’t get to Trader Joe’s often because it is just not in my regularly traveled areas. I didn’t know what I was going to get there until I saw the package of cut butternut squash. Then I was on my phone trying to find the recipe so I could make certain I got all the ingredients for butternut squash soup. I have made this soup at least twice before, but the last time I made it I put too much pepper in it. Probably not even as much as the recipe calls for, but it was WAY too hot for me to eat. I was soooooooo disappointed. But at least it didn’t go to waste because my hubby loves spicy hot food so he ate it. I remembered from the times before that one package of cut butternut squash is about 6 cups of squash and that is what the recipe calls for. With Thanksgiving coming I thought that we could just eat it all week if I doubled it. I am fortunate in that my hubby doesn’t mind eating the same thing over and over. So my plan was to make a double batch. But my plan was also to not follow the recipe exactly. Before I had made it the very first time, I had read the reviews and I believed what the majority of them said so I was already adapting, but I was even thinking of more modifications. The problem is I don’t always know what I am going to do until I do it. As I am cooking an idea will pop into my head and then I don’t always remember what I did when it comes out great. I thought to write as I cooked but I didn’t. After I sat down to eat it though I decided I had to make note of what I did because to me and for me, this is the best batch I have made and I want to make it EXACTLY like this from now on. Please excuse me for being brand specific. Normally I like to be more Rachel Ray than Martha Stewart, and I will say use whatever, but for me, I am going to use these exactly ingredients to make this soup. I really think that these particular flavors are what made it so yummy. But you of course are free to use the brands and flavors you like, but if you don’t want to lick the pot when you are done than it really might be the brands. 😉 I would have taken pictures of the cooking process had I thought I was going to post about this. I had thought NOT to post, but then after I ate it, I realized I HAD to post just so I would have record of it. The pictures of the products are after I fished the packages out of the garbage. Heat the oven to 450. Spread the squash on a pan or two, spray with olive oil, sprinkle with salt. Roast the squash. The goal is to cook it until it is soft, but it is nice to have some of it browned. Roast for at least 30 minutes. Flip, stir, or shake so as to move the squash around a bit. Here is where you decide how roasted you want your squash. Melt the butter in the stockpot, add the onions, and a little salt. Cook the onions until tender. Put the roasted squash in the pot, add the box of broth, add the water, add the contents of the broth packages, add the marjoram, add the pepper, sprinkle the cayenne. Bring to a boil. Take the pot off the burner and blend the soup until smooth. (I use the immersion blender). Add the cream cheese. Stir. Blend until the cream cheese is full incorporated in the soup. Depending on how long it takes you to blend the soup and how hot you want to serve it. You might have to put it back on the stove. 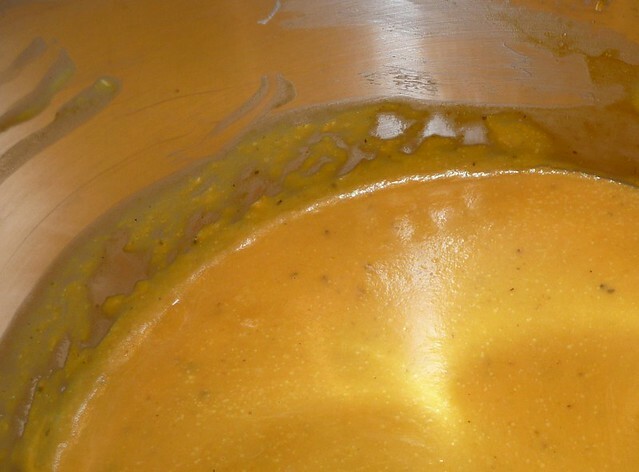 This recipe makes a nice creamy squash-flavored soup. It is not sweet, but it is not spicy hot. If you like spicy hot you can add more pepper. The actually recipe on Allrecipes.com calls for a 1/4 teaspoon ground black pepper and a 1/8 teaspoon ground cayenne pepper. That is too hot for me. I just put a few twists and a sprinkle. The thing about making the pot mild is that people can add their own heat. My hubby sometimes adds hot sauce. But then sometimes he doesn’t. He can decide. As with any recipe, of course, you can modify it as you want. But for me THIS IS IT! Also as with anything, I would love to hear what you think. Easy Dinner – Yes, Please! After I taught my Nia Class in Willow Glen I had some shopping to do. After shopping I rushed home because I was going to meet a friend in the afternoon back the way of my class, but I thought would shower so as not to offend her. It was pretty warm here. As is normal for a hot day, the late afternoon early evening is the hottest. So as I was driving home from my visit I was not looking forward to cooking dinner. I had chicken thawed in the fridge, but what else to cook? I ended up visiting longer than I had planned and getting stuck in traffic on the way home so I didn’t want to stop to get anything to add to dinner because it was already late. All the way home I was wondering what to cook. When I got home it was really hot. I thought it would be best not to turn on the oven or the stove. I had an idea that maybe using my electric skillet would be cooler. I do believe it was. 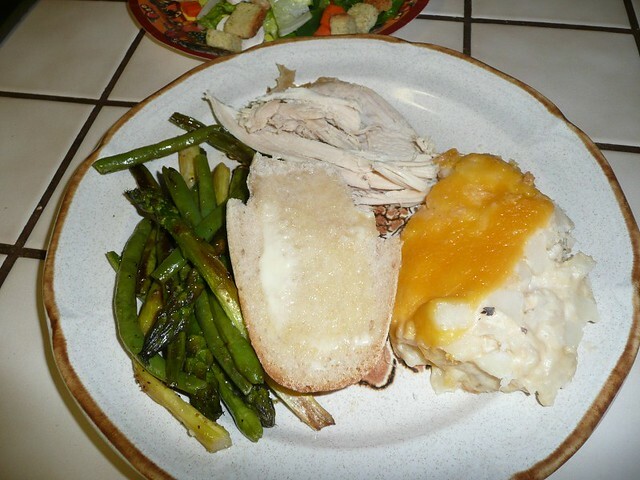 Although this is a common dish cooked in a crock pot or the oven. When you have limited ingredients sometimes dinner is really easy. I have found that with limited ingredients I come up with come pretty good meals. Some end up being regularly cooked meals. I put the rice in the skillet with about half of the broth and turn the skillet on to its highest setting. I started to cut up the chicken into bite size pieces. When most of the broth boiled off, I added the rest of the broth, the sherry, the worchestire sauce, the soy sauce and stirred, then I added the marjoram. I turned the heat down to the lowest setting. I finished cutting up the chicken, then put it in with the rice I sprinkled the garlic on the chicken with some salt. I turned it to the middle setting. I let the chicken cook until it was almost done, then I added the green beans. I stirred them into the dish and let it cook until they were done. If you know me, you know I don’t like pepper — at all. But my friend gave me some smoked pepper, which seems very different than regular black pepper. It helped finish the dish off perfectly! I brought the grinder to the table though so we could pepper our food separately. My husband loves pepper. I wasn’t planning on posting about this so I wasn’t keeping track of the time, but I think it all took about 30 to 40 minutes. That is what I will plan on in the future, but I will keep an eye on it to see. I am looking forward to using different veggies. Frozen green beans is all that I had. The last time I cooked an all in one dish I used the oven and I used brown rice and canned soup. The rice was a bit crunchy still but I didn’t want to cook it longer because the chicken was done. So that is why with this one I started the rice first, although this time I used white rice and it could have been less done. 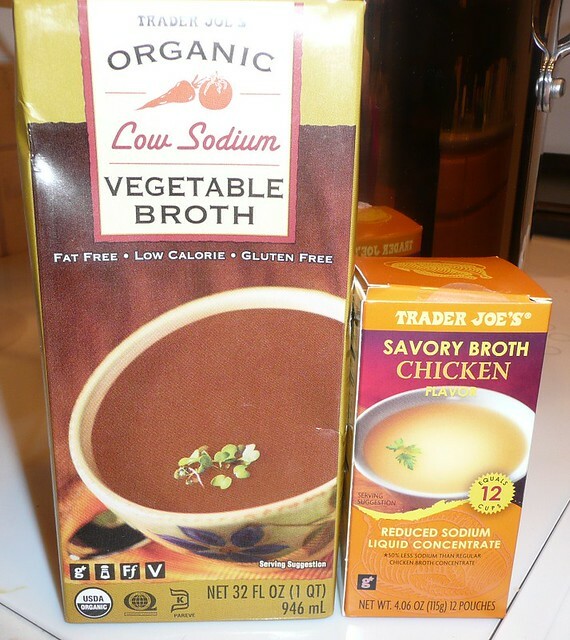 I am working my way away from using canned soup so that is why I used broth and it came out great. With the oven cooked dish I used broccoli. I am looking forward to trying different veggies in the skillet. I had forgotten about the electric skillet even though my parents use theirs all the time. I am glad it was hot and I was at a loss of how to cook dinner because now I am going to start using my electric skillet more often. 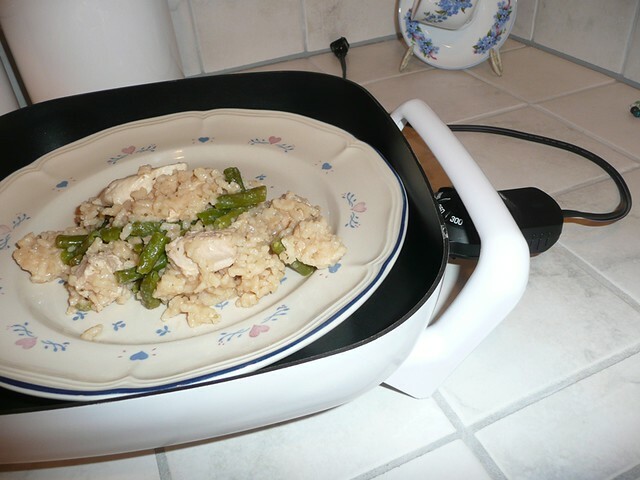 Do you have an electric skillet? If you do, what do you cook in it? Do you have any favorite one pot recipes? **09/10/11 — This actually made quite so we ate it a second night. On the third night it seemed as if all that was left was rice and green beans so I sauteed some baby bok choy and a can of chicken then put the left over rice and green beans in the pan and heated it up. Wow! I think I am a fan of baby bok choy!!! This is a Wednesday “place holder” post. I am going to teach my San Jose Nia class first then do my Ten Minute Workout. Yes, I know it is only ten minutes, that is the beauty of it. But I like to make sure I have all my “toe strength” (sounds silly, I know) for my class. But I am posting so that YOU, Dear-Wonderful-Loyal-Reader/Exerciser, have a place to comment that you have done or not your ten minute workout. When I have done mine I will post/edit/comment (not sure what yet). Very late in the day, but I did it. I finally resorted to taking an allergy pill. I took something I had not taken before — Allegra (don’t worry I didn’t take it with fruit juice). Like most medicines for allergies it makes me feel very, very, very lethargic. But, I did it. I was REALLY mellow on the lunges, I didn’t do them as I wanted to when I put them in this workout. I am respecting my toes. I believe that I have mentioned before Nia allows us—even encourages us—to do routines with different focuses. I know I have posted about focuses before. This past week I led my classes in the Nia routine called Sanjana. I believe this is a routine created by Debbie Rosas NKA Debbie Rosas-Stewart. It is an awesome routine (well, yeah . . . its Nia). I decided that I would do one of the nine movement forms per class. I know I have posted about Nia’s Nine Movement Forms before, too. I had used some of the movement forms previously with this routine, so I decided the ones we did this week would be ones I had not paired up with Sanjana. Monday in my San Jose Nia class we did the ideas of Moshe Feldenkrais. For Wednesdays Nia class in San Jose we utilized the energy of Tae Kwon Do. My Los Gatos class on Friday experienced Sanjana with the Modern Dance flair. I love this about Nia. I love that doing the same routine, but doing it with different energies allows for different movement, different sensations. Each movement form has its own energy, that is how we apply them to a routine and come up with something unique. I chose Feldenkrais for Monday because often times participants are a bit sleepy on Monday mornings. Sometimes we prefer something that moves us but something more along the lines of a stretch or a healing art. It could be that too much was done over the weekend or not enough, so Mondays are a little different. With this conscious movement as our guide we were able to focus on the sensation of the body as we moved. The dance was conscious. We could concentrate on areas that needed attention, either from the over-use during the weekend or lack of use. Whatever the case, the idea is ease. Move with ease into one’s own power and strength. This is a gentle movement form but that does not mean it is not intense. We can still move our bodies to get a great strength and/or cardio workout when playing with the healing arts, but it is with greater awareness. By the middle of the week, Wednesday’s class was perfect for Martial Arts. Nia students have “recovered” from the weekend so the whole body can be used. We have the strength to utilize the power of the Tae Kwon Do energy. The dance can be precise, by this time of the week. Two days are behind, only three are left (class is in the morning), the desire and focus needed to push on is there. Sanjana has great opportunity for dynamic ease to be exercised. There are katas that allow for the fluid moves of martial arts with dance, kicking, punching, blocking, and striking. In fact the “Exercises” listed in The Nia Technique White Belt Manual* under the Tae Kwon Do craft seems as if they were written expressly for Sanjana. Friday, unknown to me at the time I planned my dance week, was a great day to do Modern Dance. With the tsunami that hit Japan over the night (Thursday night for us, Japan’s Friday) it was a great time for dance. Modern Dance calls you to express yourself. This movement form is one of imagination. You can be big and/or small, fast and/or slow, a tree, a rock, sand, water, air, even a feeling. People can truly dance whatever they want. So while we are still practicing our stances the feelings put into it are those of the participant. Movements led by me are executed by whatever sense is being experienced. Many people had different issues and feelings to work through. Even if some of those feelings were a celebration with the understanding that life is short and precious so we need to celebrate what we have while we have it. This form is that of balance–both on and off, flexibility, strength, power, drama, emotions . . . whatever fits. It was a great way to let our bodies move while our hearts went out to all that were affected. Nia is awesome like that. We danced the same routine for all three classes this week. With each class it was different while we paired up the routine with different movement forms. While the movement forms were able supply the energy, the “feel”, the sensation that was required for the day. This Thanksgiving, I was blessed with two different Thanksgiving dinners. On Thanksgiving we went to my in-laws in the San Jose area. Then after I taught my Nia class in Los Gatos on Friday, we went to another family members and had ANOTHER Thanksgiving dinner. What do you do with your leftover turkey meat? If I am lucky enough to get any (my mother-in-law gave us a huge bag full—yay! ), I usually make turkey sandwiches, but they are usually pretty plain. Bread, cheese, mayo, and lettuce. Well, that is for my hubby, I usually have cheese OR mayo. What about you? Do you make sandwiches out of your leftover turkey? How? Toasted whole wheat? A dinner roll? Do you use all the fixins? The cranberries and everything? What about avacado? Do you make turkey chili? A turkey salad? Or turkey salad . . . . .like chicken or tuna salad but with turkey instead. If you have enough left over you can make a multitude of things and never really eat the same thing over again. I am seeing information that turkey is a super food. Ya know, that “super food” stuff, but it is in a lot of the websites so it must be considered one of those foods. Here is an idea of what you are getting when you eat your turkey. Either right after it is cooked or when it is remade into a new meal. I am just about to make myself a plate of leftovers, but I would still love to hear what you do with yours leftovers. Do tell! Recently in my San Jose Nia Class we used elbows as our focus for the class. The intent was to sense the connection that our elbows have to our entire body. As we moved we connected them to our hips, our ribs, our thighs, our knees, even our toes. An easy and almost automatic connection is elbows to shoulders. Well, for me, this focus allowed me to move my joints to a state of complete and utter looseness. I felt very loose and relaxed all day long. That same evening I went to an Ecstatic Dance class and I almost felt as if I could bend like a contortionists. Notice I said ALMOST. In reality I could not bend like that, but I was sensing a greater flexing in my joints than normal. Since I was actually aware of this and sensing it I decided to move with caution. When I get the opportunity to just Free Dance with others that are doing their own thing I really end up moving. I work up a sweat and get a really great workout. But this time since I felt my joints might be able to bend more than normal I kept reining myself in. I didn’t want to end up injuring myself. I thought of my former dance teacher who used to do very deep stretches with her legs. Since she COULD stretch so deep she would do it all the time thinking she was doing her body good. But it turned out that all of that stretching ended up putting too much strain on her ligaments. She ended up having to have several surgeries on her knee. She was double jointed or had knee joints that hyperextended. If you are double jointed it is good to use caution when moving because just because you CAN move like that doesn’t mean it is good for you to do so repeatedly. The focus of this post is more about loose joints and not double-jointedness. It is very important to stretch and be flexible, but there sometimes is a point when we are too loose or more accurately too loose to just let loose. We need to know when to rein it in and take it easy. Listening to our body and using body knowledge and awareness we can help from allowing ourselves to get injured. If you normally cannot do a particular move but today you sense that you can, stop and think can you really? Is your body ready? If you are sure then by all means do it because doing what we couldn’t do before but can do now, is how we grow and progress. But if you are not sure then maybe you want to wait until you are certain because you don’t want to end up having to start all over if you injure yourself. If your joints are not used to a deep stretches then work slowly into it. If you have done a juicy yoga class or Nia has all your joints open and saying “Ahhh!” but your joints are not always that loose – proceed with care doing any additional exercise. Be sure to enjoy the sensation of happy joints. Have you ever sensed the sensation of loose joints?